In the fourth round of the European Individual Women Chess Championship the game between two leaders Marie Sebag and Viktorija Cmilyte finished on favor of French player. After 4 rounds Marie Sebag became the sole leader as Cristina-Adela Foisor slowed down the rate and made a draw against Antoaneta Stefanova. After the third round of the European Individual Women Championship, only three players from the whole tournament left with 100%. Defending European champion Viktorija Cmilyte won the game against Jovana Vojinovic, Cristina-Adela Foisor and Marie Sebag were stronger in the games against Tatjana Kosintseva and Natasa Bojkovic accordingly. Before the start of the second round of the European Individual Women Chess Championship FIDE Vice-President and the President of TCF Ali Nihat Yazici made an announcement: "The Chairman of the FIDE Qualification Commission Mr. Mikko Markkula has passed away. He was a good friend of us." All players raise up for one minute of silence. 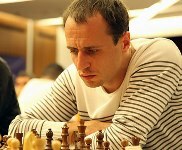 Evgenij Miroshnichenko (born 28th of December 1978), or "Miro", as he likes to be called, is international Grandmaster since 2002, two times Ukrainian Champion (2003 and 2008) and a winner of numerous international tournaments. Growing expert of women chess, as you can remember his reports and comments during the World Women Team Championship, Evgenij is going to provide us with analysis of the most interesting moments happened in the games during the EIWCC as well.